A mere 12 days into 2016, I have finished my roller derby photography commitments for 2015. The last game of the year was a fairytale-themed intraleague hosted by Fierce Valley Roller Girls at Grangemouth Sports Complex on December 12th. 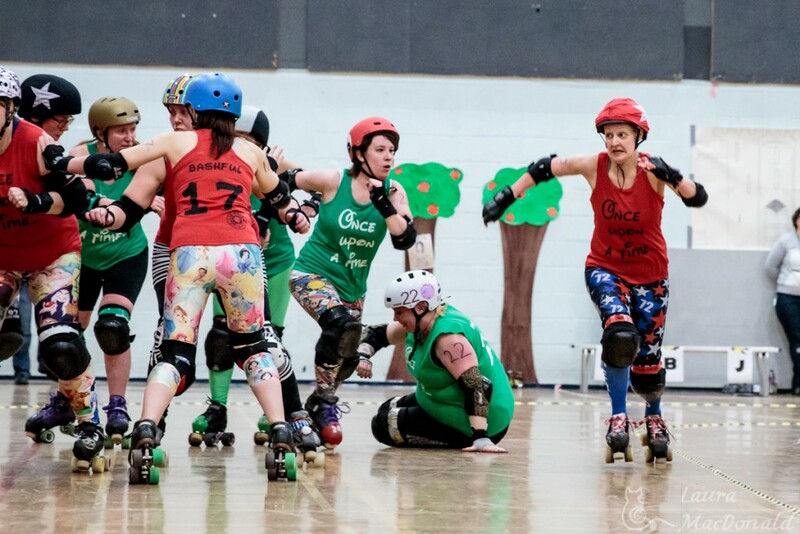 I love photographing derby, but when I’m tired, and particularly at end-of-year games, I seem to lose my ability to use my camera – I can’t hold it straight, focus is all over the place, reaction times are slowed, etc. etc. so for me this photo set is a little sub-standard. Not helped by an Adobe software issue (or maybe I just pressed something…) and my trackball slowly breaking during editing (probably failing micro switches). I always feel like I’m making excuses when stuff like that happens, but skaters looked Tangoed and it was just about impossible to crop photos when the trackball was merrily insistent on cropping tiny bits of floor at a 45 degree angle, instead of skaters … (trackball now replaced). A number of months ago, one of my fellow roller derby photographers recommended I try back button focusing for my derby photography – this changes the camera’s settings to take focusing away from the shutter button and assigning a button on the back of the camera body to focus instead. This can make focus faster and more reliable – certainly I’ve found my 70D is less ‘hunty’ when tracking continuously moving skaters. It takes a bit of getting used to, and as I’d only just upgraded my camera at the time and my fingers were all over the place, pressing the wrong buttons (I even accidentally deleted an unplanned but lucky photo I took of tennis player Andy Murray outside Dunblane Cathedral) I decided to wait until I was used to my camera before I tried it. In November I decided to give back button focusing a go, and this was the fourth game I’ve shot using this technique. With 2015’s derby complete, I’m looking forward to 2016. The ‘off-season’ for roller derby leagues is largely over and they’re returning to practices, but in Scotland at least, fans have to wait another couple of weeks to see their first game of the new year. On the one hand it’s nice to have some free Saturdays, on the other I’m itching to start photographing again!